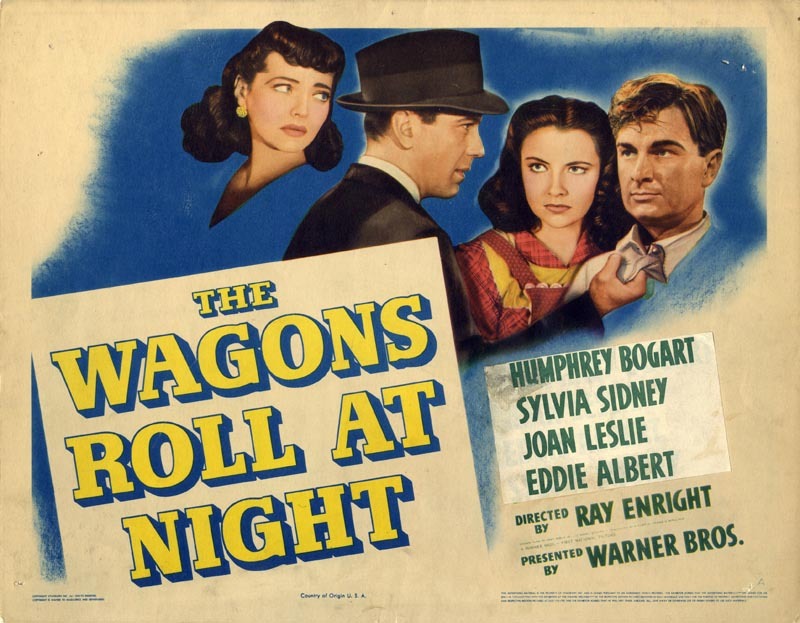 “The Wagons Roll At Night” reveals its hard-bitten ethos right away when a proprietor of Coster’s Carnival complains of having his pocket picked and threatens going to the police. The Carnival’s titular founder, Nick Coster (Humphrey Bogart), tries to talk him down, finally surrenders and coughs up the cash. What other choice does he have? The guy’s right – Nick’s carnival isn’t exactly on the up and up. And therein lies the delineation. Nick’s girl, Flo (Sylvia Sidney), tells him he’s torn between the Carnival, emblemized as a no-good gypsy life, and the Circus, which is the stuff of DeMille’s “The Greatest Show On Earth”, epic, heroic. But Nick, it is eventually proven, is no hero. He’s carnival through and through, and that will be born out again and again in “The Wagons Roll At Night”, a nasty little B-movie that masquerades as a sweet melodrama here and there if only to underline the devils Nick has perched on each shoulder. The story turns when a lion gets loose and prowls the town where Coster’s Carnival has set up its tents. Eventually the king of the forest winds up in a cozy little drugstore where gee-whiz fella Matt Varney (Eddie Albert) has to save a little baby girl by fending the lion off with a pitchfork. Not one to miss an marketing opportunity, Nick hires Matt on the spot with the intention of turning him into The Great Varney, lion-tamer to end all lion-tamers. Instead Varney finds himself cleaning up after the lions, and when he expresses dismay to Nick he is told that it’s all part of the plan – “You have to crawl before you can walk, you have to walk before you can crawl, see what I mean?” Of course, this is all just spit and polish. The next scene finds Nick’s actual lion-tamer, Hoffman the Great (Sig Ruman), drunk and unable to perform; Varney, who was just told he was not in any way ready to lion tame, tames lions. This might seem to set up “The Wagons Roll At Night” as the rise of a star performer, or an expose of the carnival’s inner-workings. Not quite. Instead the movie turns, abruptly, as Hoffman the Great picks a fight with The Great Varney, which concludes with Hoffman being clawed by a lion and the blame being unfairly placed on Varney. He flees, hiding out at Flo’s behest with Nick’s sister, Mary (Joan Leslie), for whom he promptly, obligatorily falls, which enrages Nick because he wants his sister to mingle with a better class of people than these dreadful carnival workers. Well it doesn’t take a PhD to see then that Nick hates himself, doing everything he can to keep these two aspiring lovebirds apart, and by everything I mean EVERYTHING. He has no morals – after all, he instructs people’s pockets to be picked, remember, and amidst all these romantic machinations, played by Albert and Leslie like a sock hop fling, something wicked this way comes, and it comes in the form of Bogart. Varney’s part is written as such a product of the plot, you’re almost disgusted by his naivety, his willingness to keep going right along with Nick’s dastardly schemes against what would be anyone else’s better judgment, which Albert has no choice but to play up because otherwise none of this makes any sense. That might’ve left the movie to founder. But Bogart positively oozes guile with every empty plea he makes and every lie he peddles and every rotten act of supreme selfishness, and in a crucial shot toward the climax, as Bogart lets his nefarious smile melt into emotionless contempt, you believe, really believe, that he’d feed someone to the lions.